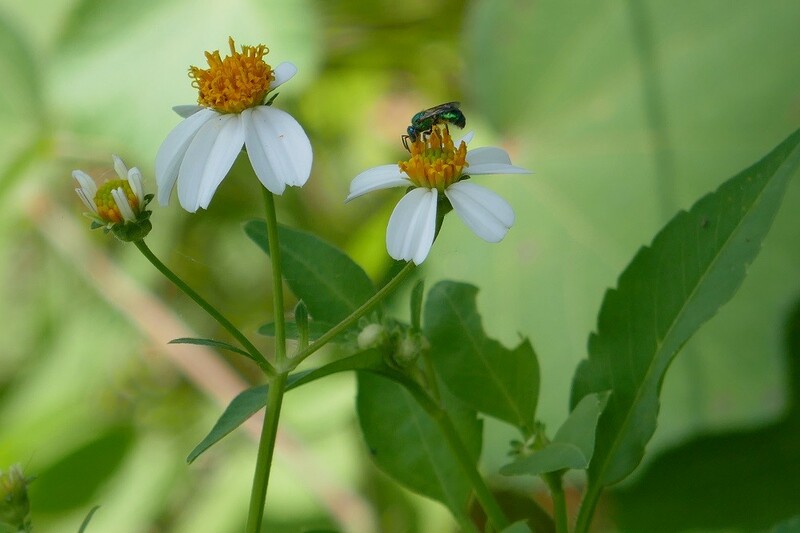 Spanish needles (Bidens alba) is my favorite wildflower because it is free, easy to transplant, survives on its own, the bees and butterflies love it, it has beautiful flowers, and it is edible. Spanish needle is a tough plant that is a very important nectar source for bees and butterflies in early spring. People either love it or hate it. I’ve honestly never seen the disdain for it considering it’s such a useful plant. Spanish needle tends to be a wildflower that has a mind of its own and tends to start growing in places where it may wind up being in the way, but that problem is solved easily enough by transplanting the volunteer plants. I never mow anything in the spring until I see what plants are coming up first. Some say it takes patience, but it really just takes letting go of the need to have the yard sterile and perfectly tidy. 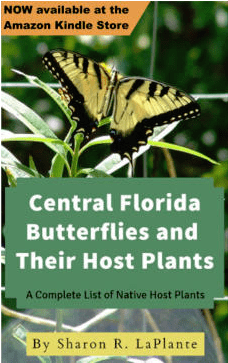 Having the wherewithal to realize the wildlife uses of the native plants in one way or another also helps to see farther than what is perceived as the untidiness of the plant itself. After several weeks of not mowing in the spring I usually have many new plants that I can leave where they are and mow around them or move them to more desirable places such as near fruit trees that need to be pollinated by the bees. The plants that I decide to leave have chosen their spot and will survive on their own with natural rainfall. Spanish needle can be transplanted even when it is rather large so there is no need to search out tiny seedlings or be ginger with their treatment. However, I usually go for plants that are about a foot in height because they have smaller root systems and will fit in small pots. 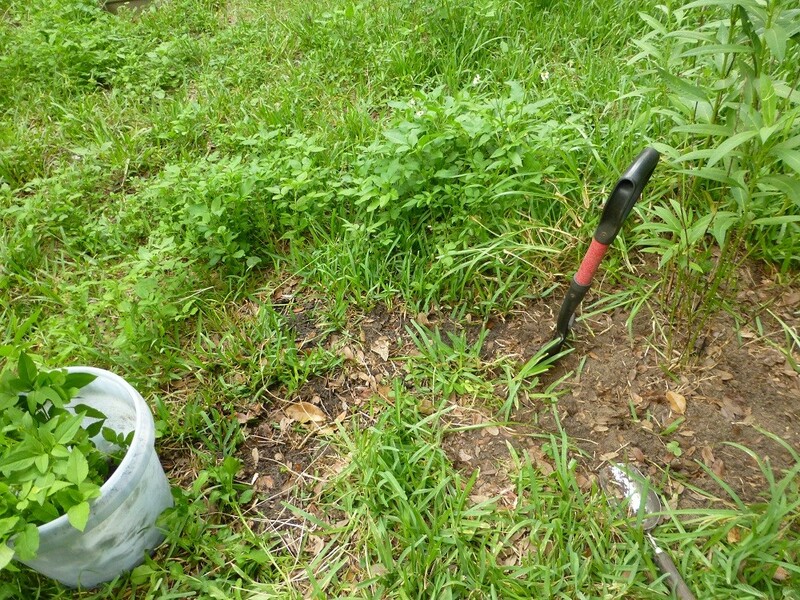 In the photos you can see an area where Spanish needle seedlings had started growing in one of my walking paths so I dug up, and potted, the amount I wanted to deal with and tossed the rest onto a brush pile. I suppose that is another bonus … since they are abundant I don’t feel guilty about letting some go into the brush pile. There is no need to be ginger with removing them from the soil just put your spade in the ground and start to dig them up. Also, there is no need to worry about how much soil stays attached to the roots. I put them in a bucket with a little bit of water until I get done with the area that I’m working on. 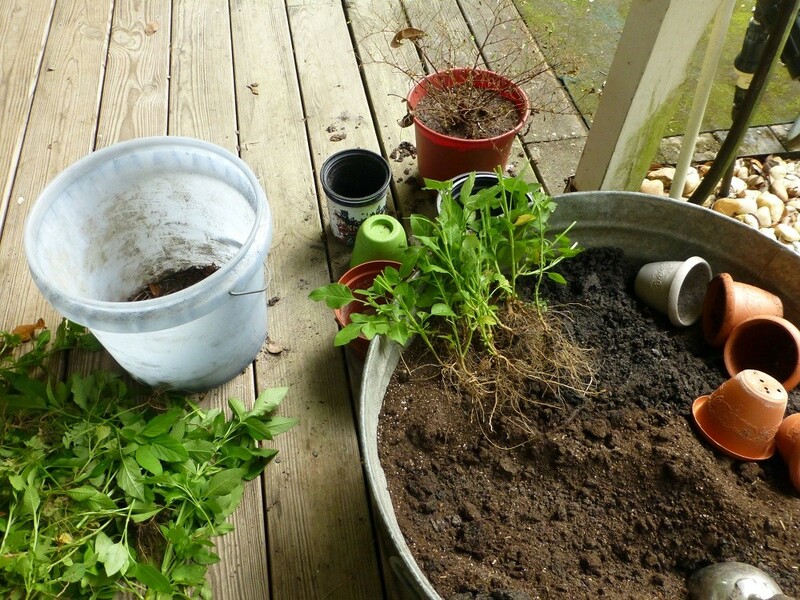 If the soil is loose enough they can be pulled out by hand, but I wouldn’t suggest it as they tend to break off and it causes more stress to the plant. Once you have a bucket of small Spanish needles get them, and yourself, into some shade and start potting them up. I use small pots so I don’t have large plants to deal with. 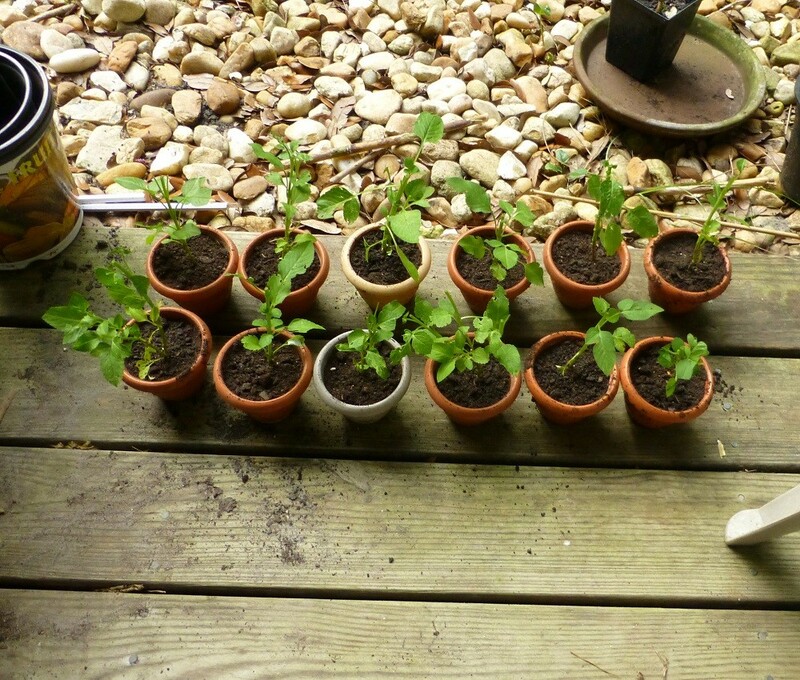 Also, having the transplants in small pots allows me the convenience and ease to quickly plant one or two without the need to prep a large hole, and their small size allows me to plant one anywhere I can get a small trowel into the soil.To reduce the shock of pulling them out of the ground some of the upper growth needs to be pruned. I cut about half of the growth off of the top of each plant. I am not particular about this and generally just chop the plant in half. Place the small plant into your pot and fill with potting soil pressing down firmly. There is no need to water each one as you go just wait until the batch is done and water them all at once. Your new plants will be in shock so be sure to keep them watered. I do not worry about hardening them off especially if I just removed them from a sunny spot so I put them in full sun and just keep them watered regularly. I do like to use a tray to retain water and keep them all together in one spot. The newly dug plants should be given enough time to recover from the shock before you go about putting them out in new spots. Wait a week, or two, until you start seeing new growth before you plant them out. Once you plant them into your desired spots keep them watered until they are established or you have natural rainfall to supplement watering.Once you get them established in new areas of your property they will reseed so you’ll only have to do it once. Also, if you wait to transplant them during the rainy season you won’t even have to water them regularly to get them established. It’s pretty much plant them and forget them until you reap the rewards of your garden being filled with butterflies and bees, and the free greens if you so choose to use them in your kitchen. 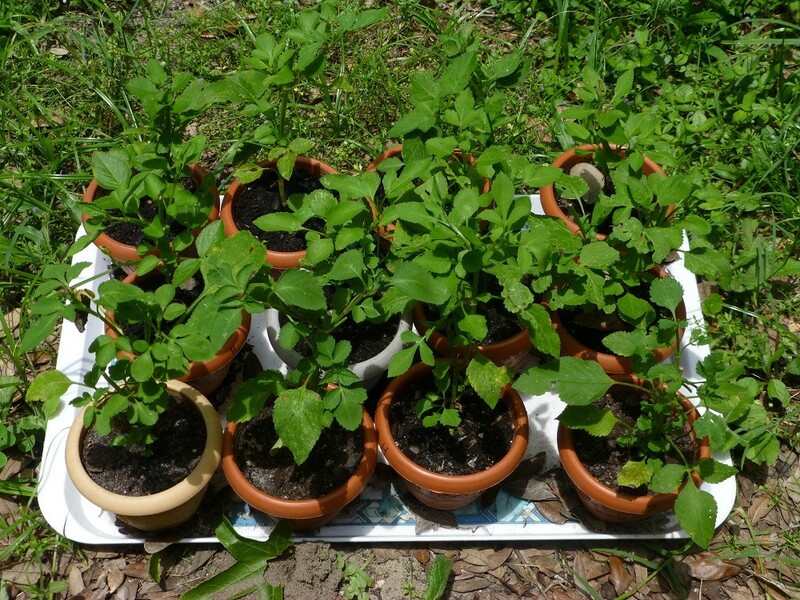 The young tips are great in salads or used as spinach in recipes. The flowers are also edible. Spanish needle is an amazing pollinator attractor. 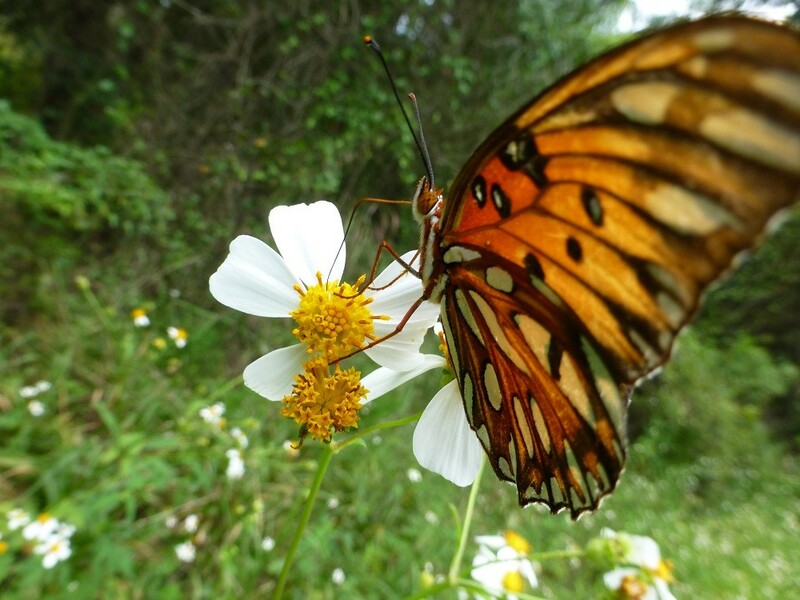 The bees, wasps, and butterflies adore the open blossoms with their white petal landing pads. Many times throughout the season it is the only flower that is blooming at my place and I am very grateful. Once you give Spanish needle a chance I think you will appreciate it for all that it is. Seriously, who doesn’t want maintenance free plants there for the taking? If you consider yourself to have a black thumb and can’t grow a thing I would ask that you try this wildflower and see what a great gardener you can become. You will love the ease at which it grows and your bees and butterflies will appreciate it as well.